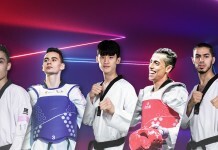 SEOUL, Korea (Nov. 15, 2017) – Team Korea’s Kyo-don In won gold against the world’s best taekwondo fighters at the London Grand Prix Series 3 – but the hard-kicking opponents on the mats were far less formidable than the deadly enemy In has been battling in recent years. In started the sport at age seven, and by 10, was competing. Always a big, strong lad, he was nicknamed “The Bear.” An obvious talent, he decided to major in Taekwondo at the elite, martial art-focused Yongin University in Korea. 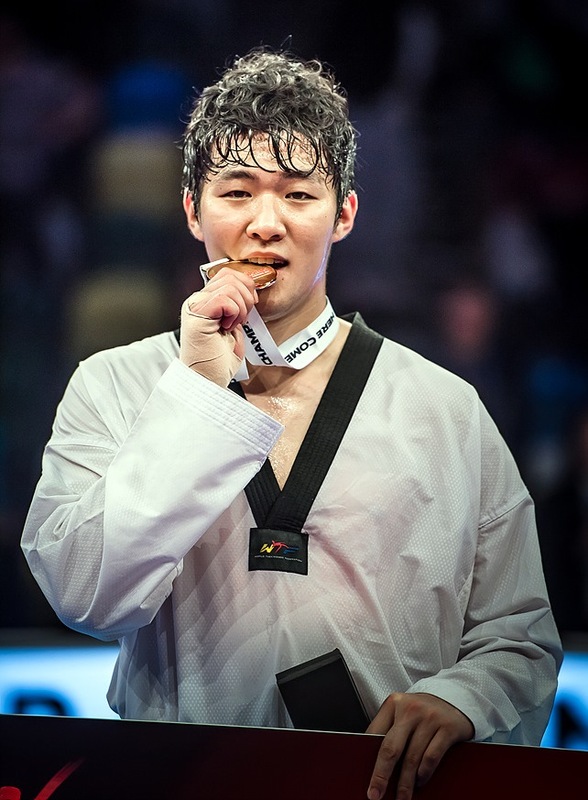 As a fighter, he first came to global prominence when he won gold at the 2015 Summer Universiade in Gwangju, Korea. Then, at the age of 21 in 2013 the hard-driving In discovered a lump on his neck. “I left it at the time, because I thought it was related to muscle, since I exercised hard every day,” he recalled. “But it stayed there for over a year.” He finally visited a doctor. After several examinations, he was told what the problem was. What he learned stunned him. “The doctor diagnosed a malignant lymphoma, which is very bad,” In said. “I could not believe it! I never thought that I would get cancer.” In August 2014, at the age of 22, he underwent surgery. The surgery was successful but he was still not out of the danger zone. Post-surgery, “The Bear” began the fight of his life. From September to December, he underwent a range of traumatic treatments. “It was very painful,” he said. “I not only lost my appetite, even the smell of food made me nauseous.” As the treatment continued, In’s agony skyrocketed. “It got worse as it continued,” he said. “I thought it would be better to die if I had to receive more treatment, because it was so painful.” His thoughts drifted to suicide. And the decline in his physical condition was impossible to mask. “One time, I met a referee who I know by chance and he said, ‘How can a taekwondo athlete have a body like you? You must manage your body!’” In was devastated. “I was very upset and had to cry in secret,” he said. He was fully back on form by 2016, winning gold at the Asia Championships in Manila, Philippines. Now, in 2017, he is surging: In is one of the most consistent medalists in the heavyweight division. 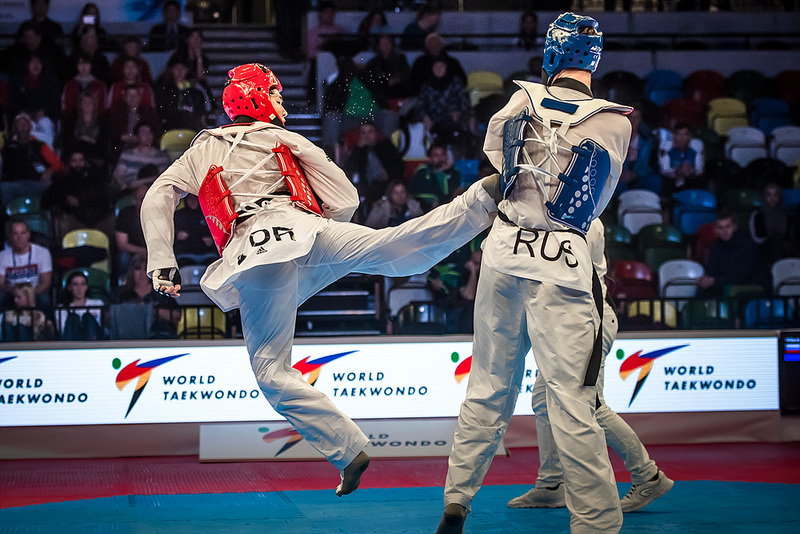 He captured bronze at the World Championships in Muju, Korea, silver at the Grand Prix Series 1 in Moscow, Russia, gold at the President’s Cup, Asia Region, in Tashkent, Uzbekistan, bronze in the Grand Prix Series 2 in Rabat, Morocco, and gold at the Grand Prix Series 3 in London, Great Britain, a victory that qualifies him for the new, big-money Grand Slam Champions Series at the beginning of 2018. The speed of his return to form has surprised even In himself: “I got better result than I expected in Grand Prix series,” he admitted. Unlike most athletes, who study their opponent’s in painstaking detail, In said he only cares about his own game. “My coach kind of gives up on me during competitions, because he knows that I just do whatever I want to do on the mats!” he laughed. His key advantage, he assesses, is timing rather than power. “I am tall but I am comparatively smaller than other athletes in my weight category,” he said. “My strength is that I know what to do at the right moment; I can figure out the situation very quickly and control the game.” In terms of kicks, he likes front and back kicks, and tends to pick up points for head kicks. When it comes to kick placement, he is more of a sniper more than a machine gunner: “I kick when I find the unguarded point of the opponent,” he said. Now fully cured, his sights are set on the new Grand Slam series, though he confesses he does not really get what the concept of the nascent series is. He is also in the final stage of getting his masters in Physical Education at Yongin, “…but because I’m busy with competitions, I cannot focus on writing my dissertation!” After his competitive career finishes, he sees a future outside the game. Having defeated cancer – In is now fully recovered, though he still undergoes checkups twice yearly – he warns that nobody should take life or health for granted.